If you’ve ever come across Microgaming’s cracking sci-fi slot, SpaceBotz, you’ll realize that the leading slots developer do the space theme pretty well on the whole. 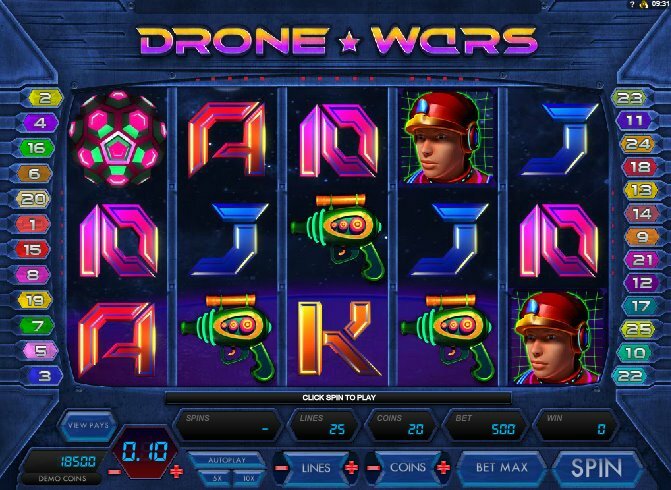 Slot developer Cryptologic put the ‘space’ into ‘spaced out’ with their own cosmic slot, Outta Space, and with Drone Wars, online casino software developer Microgaming have seemingly done a weird mash-up of the two games. Bathed in neon, and featuring two space pilots, robots galore, rockets and ray guns, you know pretty much where you are as soon as you load up this 5 reel, 20 pay-line slot. Betting starts at just $0.01, with a $100 maximum bet on offer for bigger players. The purple energy ball is the game’s Wild, and it substitutes for all regular symbols other than the Scatter. Three or more robot cyclops symbols, meanwhile, triggers the bonus round. First you’ll have to choose between two games - Planetary Assault and Space Attack. Planetary Assault sees you on enemy territory, having to destroy the robot base. ‘Pick ‘em Bonus in Space’, Planetary Assault requires you to choose targets, each successful hit rewarding you with a cash prize. Keep going until either your shields have gone from enemy fire or you’ve won. If you’re successful, you’ll get a bonus added to your haul of 50x your total bet. The Space Attack option, meanwhile, is a free spins round, with 5 spins awarded. 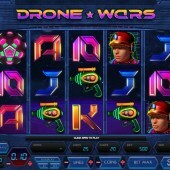 They’re straight free spins, but additional Wilds can be won as drones spin round onto the reels during the bonus round. Spins can be re-triggered by hitting a further three or more Scatters. Even though the tried-and-tested bonus rounds won’t exactly blow you away, the neat addition of random Wilds makes the free spins at least a little original. The overall theme is great, however, and fans of space-themed slots will gladly add Microgaming’s title to their list of must-plays. For me, SpaceBotz, from the same outfit, offers a bit more in the way of action, and that still is my first port of call when I want to explore brave new worlds and civilizations without leaving the comfort of my bedroom.